Daikaiju has been up to a lot since I reviewed their debut album in the first Freaky Tiki Surf-ari. After issuing their “Flight of Garuda” single, the band released their second major album, appropriately named Phase 2. In “Escape From Nebula M Spacehunter” (named for the location of the aliens who controlled Gigan in his first appearance), Daikaiju shows they’re back with a vengeance. The creepy, sneaky opening quickly leads into a rollicking surf ride with plenty of great variations. While I can’t say for sure whether or not this album’s “Flight Of Garuda” is the same as their single release, I can definitely say it’s fantastic. It has a great bouncy feel and a classic speedy surf intro, while the machine gun-esque drums are used to great effect. “Laser Runner” is reverbtastic and has a ton of spacey, laserlike chords. It’s also one of my favorite tracks. Don’t let the name fool you, “Za Feijingu Supaidaa Kyoui” is actually their classic track “The Phasing Spider Menace” (from the EP of the same name). Although it seems slower and more methodical than the other tracks, it soon kicks into high gear and offers an eerie “phasing” feel. Listeners of our podcast should recognize “Choujikuu Mitsukai” (translation: “Super-Dimensional Angels”) offers a feel of grandeur that gradually enters its surf goodness and the almost 10 minute long “Jellyfish Sunrise” somewhat echoes their first album’s “Farewell To Monster Island” without copying it. It’s soft, soothing and the rhythms are like a gently undulating jellyfish. The catchy beat doesn’t hurt, either. In “Mr. Smoothstar,” drumbeats signal in fast guitars, but they soon combine for amazing results while “Shooting The Wormhole” nicely follows preceding track with its reverby classic surf feel. “Forcefield Lifts Over Neon City” is another fairly lengthy track which uses a slow, soft drum build to kick in an interesting beat and great guitar work. It’s hard to describe this, but there’s a “force field” feel at points, in addition to some great musical variations (as is case with all their long songs). “Zombie Harem” touches on a lot of things used in other tracks on album while having more than enough original material to make for an interesting (and sometimes eerie) listening experience, making it the perfect closer for the album. 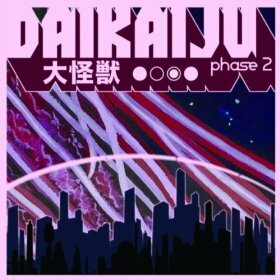 Phase 2 has the classic Daikaiju feel to appease fans of the first album while at the same time allowing their style to change and grow so they can further develop as artists and bring in new fans. In short, it’s the perfect sequel. I’m already looking forward to Phase 3! Special thanks to Daikaiju for use of the image!